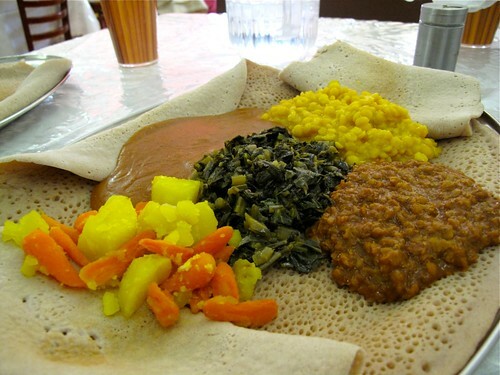 The vegetable platter has several delicious stews and greens, served on Injera of course. You’re there for the food, not the atmosphere. The TV is always playing an African news station with interesting commercials. Damn this is some good Ethiopian food. I love everything on the veggie plate, I couldn’t even pick a favorite. OK, maybe the red lentils are a favorite. But absolutely everything is perfectly spiced: you’ve also got collards, potatoes and carrots, pureed chickpeas and yellow split peas. It’s just a total festival of flavor and texture. And who doesn’t love eating with their hands? The service is pretty fast (a total bonus of being vegan…it seems like the meat stuff takes longer.) Everyone is friendly (the owner came by more than once to ask how we liked everything) and it is dirt cheap. 6.95 for the veggie plate, I think. And that can totally feed two people. The atmosphere isn’t bad, it’s just a little odd because first you walk into a little grocery store with lots of dishwashing liquid and stuff and then the dining room is off to the side. Plus, it’s just called Ethiopian Restaurant, which is kind of nondescript. But get over it and eat here.